Save Yourself A Huge Headache When Packing For Your Move! When it comes to packing and moving a little TLC goes a long way to getting your belongings safely to your destination with less headache. Ever get that feeling when you leave on a holiday that you’ve forgotten something at home? Besides the basics (tent, sleeping bags, pillows etc.) follow our staff’s top 10 list for things to bring with you camping so you don’t forget those little things again! Be prepared for the outdoors and bugs! 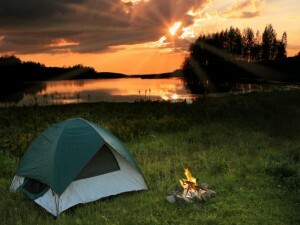 Having a sunburn or bug bites can make a camping trip very uncomfortable. Make sure you keep a First Aid kit with you in case of any accidents or injuries. Have an extra set of batteries with you or use a solar powered flash light. Most of us always have our cell phones but don’t forget the charger; you don’t want to remember in a time of emergency. You might need the axe to chop wood and the matches to light your fire, don’t forget to put your matches in a water proof container so they don’t get wet if it rains. Don’t forget to pack in case of an emergency and you’re stranded. A little extra food and water can go a long way. Remember your bathroom items you might need them. Bring Antibacterial Wipes they are more convenient for soap and water when around the fire for your sticky marshmallows or around other messes. Go green don’t forget to pick up your garbage. Use a different bag for cans/bottles to recycle later. Don’t forget while you’re enjoying your trip to take photos to remember the great time later. For a more extensive packing list visit: Camping Essentials List We hope you enjoy your vacation this summer!